Here are some comments about AgEdNet.com. I want to make a comment too! [I] enjoy the variety and lesson plans are great. Thanks for all that you do to keep it current and thanks for asking our thoughts with this survey. You provide a great service for agriculture instructors. It really helps since we are supposed to be a jack of all trades and masters of none. Thank you. Can you send a few more hours in the day to me so I would have time to peruse and take advantage of all the information and resources AgEdNet.com has to offer? That seems to be my biggest constraint these days. Thanks! Improved? Not sure. I love using this source for everything listed in question three [classroom teaching, preparing for ag issues competition, preparing for leadership development events, independent study, material for substitute teachers]. I would recommend this to any new or old teacher! Convenient and up-to-date. Kids love the format, and so do I. [I like] the up-to-date content. I have really enjoyed the addition of the video links. They have been a great resource to use during a variety of lessons. I love the completeness of each lesson and the exercise ideas, questions & crossword puzzles that follow each lesson. I am very pleased with AgEdNet.com's continued improvements. I like that I can pull off an informational packet that I can use for notes, the students to read in class out loud or to themselves, or I can use the packet for something to assign on the day of a sub. I like the lesson library. It is a great resource for me when I have a sub. The students know what they need to do and they do it. [I like] the concise manner in which the information is written, the quizzes, the crosswords, the current articles and weekly quizzes. All of these things make my planning so much more do-able. I like how it's sorted into topics easy to grab and go. I like the resources added to the bottom of each lesson. 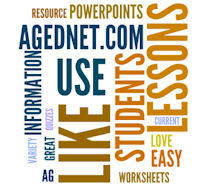 I find that I can use AgEdNet.com in a variety of courses and age levels. That is very nice. Variety of topics is great! Ease of lessons to use for students and teachers. The improvements to date have been very helpful. The printer friendly versions [of the lesson tests] are better. I have been an active user for years. You are constantly adding and improving. The crossword puzzles and PowerPoints are great. It is great that the vet science lessons coordinate with the vet science text by Lawless and Baker. Keep up the great work and keep adding!! I like the variety of topics that are available for use. [I like] the wide variety of lessons and how easy it is to find the area I am looking for. All the materials are provided and can be used alone or together. I know the lessons are very professional. It is a great way to present material in a different format and a way to mix up instruction. I like the information in smaller, several page, focused topics. Students are not overwhelmed or distracted with too much info at one time. I like having new and relevant information for my lessons. The articles are a good supplement to the textbooks and the other materials that I already use to teach from. It priceless to have someone doing research for me and saves me a ton of time. I find your materials easy to search through. [I like] the current updated information. The test and crossword for the lessons. Internet links. I teach college students and while I do not use AgEdNet.com regularly, it is a great satisfaction knowing it's available if I get in a jam and need immediate information. Like the organized lessons, PowerPoints, puzzles, videos....Your improvements to date are great. Thanks, Keep it up. Get for substitute to use teaching guide and can go with it!! Like -- The prepared PowerPoints, suggested activities, resource guides. Very current, easy for kids to understand, teacher material excellent. I like the variety of units. I like that I can use it to teach or can have students do it independently. Easy for students to use. Lots of good information for students to use in Ag classes as well as other classes -- students will ask if they can use AgEdNet.com for papers in other classes -- economics, English, etc. They have great lessons ready when I need it. The articles are great as well. It's something geared to my child's interests. I home school and he probably wouldn't receive this type of instruction at his designated school. He's actually been teaching us at times, if he is interested he will learn. Best -- the variety of lessons & activities. I like that up-to-date info is there for students. If I'm not using the lesson library to enhance what I'm teaching in the classroom, I'm using it to enhance coaching my FFA teams and helping students get ready for discussions on current ag issues. I now have my filing cabinet arranged like the AgEdNet.com lesson libraries. [I like] the interaction within the class for my students -- I like the crossword puzzles [and] the videos too. So far the AgEdNet.com material has been great for my Ag classes. I feel the material covers the units in a way that the students can understand. I like the fact that the AgEdNet.com site is up to date. It has been a while since Texas last adopted textbooks for the Ag classes. I feel the AgEdNet.com site will eventually take the place of our books. The AgEdNet.com site is well worth the money. The links are very good. Lessons are short. It is a good program. I also use it to help prepare my students for HOSA. I was on maternity leave earlier this year that this was an awesome way to continue with my curriculum when a sub was there! I love the service and it is great! I mainly use it as additional resource for related units and for speech research. Lesson content serves as online textbooks for our students. Our school has 1:1 computers for students in grades 7-12, so we use this service as their textbooks. I have found AgEdNet.com even more useful than before. I am teaching bio this year in addition to ag classes. The lessons in AgEdNet.com are easier for students to relate to while learning the same material that they would normally have to learn. I specifically have used the lessons on genetics, genetic engineering, and biotechnology in this class. Using your materials makes it easy to multi-task in class. If students are really interested in a subject, they have sites they can go to for other information -- they like this. Best thing -- Good materials and training on subjects I may not be knowledgeable in. Many times I have to teach something I may not have personal experience with, and as a 1st year teacher, that is a big help! I like the overall format and ease of use. The length of the lessons and follow-up quizzes is appropriate. The selection of lessons is great....Thank you for this service. I like how the site is organized and the broad range of topics. It's also easy for me to give students makeup work while they are at home. Some of the younger students have a difficult time with content and reading level (grades 6/7). I really like the variety of topics ... students at the high school level really like being able to have options, and I frequently give them choices of lessons in order to better customize their education to their personal interests. It's a very good source of information to use in unit lesson plans, or daily outlines. I like the search feature when I'm surfing for material. I like the Ag issues for speaking topics. I love having a variety of topics. There are a lot of things that you can incorporate into any lesson. I really enjoy the opportunity to utilize the large database that AgEdNet has to offer. Utilizing the many lesson plans as an additional resource to maximize learning in a certain subject matter is very helpful for a busy ag teacher. Giving the diversity of the agriculture industry and what information you have to offer in a very accessible package, I really don't have any major suggestions that could improve your services that are made available to ag teachers. I find AgEdNet.com an up-to-date reliable resource and curriculum for my Ag Education program. I have avoided purchasing textbooks and using the AgEdNet.com as resources and information for my classes and for student reading. It is a great source for substitute teachers for classroom assignments or PowerPoint presentations. I like its uniformity from lesson to lesson. Great resource for my class lessons. I find the lessons very useful. They are the right length and provide good information. I like the notes page on each lesson topic. I like how each lesson has a few pages of information pertaining to it. The information that is given has an upper level science content which is very good. I use this site daily to help support lecturing & examples. I really like this website. [What I like:] Timeliness of material. Flexibility of having 25 students on same material @ reasonable cost. Timing drills on Crosswords. Ease of use for substitutes. Hyperlinked photos. [I like] the updated material that comes in from all over the world, lesson library, quizzes, teachers guide, etc.... website is very helpful to our program. Quick way to find information and review the websites given at the end of the lessons. I like the way that the facts are put out there and the main points are made without going on and on. The students seem to really enjoy the readings because they maintain their interest. The majority of the lessons complement my textbooks and/or CDE materials. It is very easy to fill in my lessons plans with AgEdNet.com lessons on a busy week. I really like the powerpoints for daily teaching use, saves me a bunch of time. I love the PowerPoints, they save me a LOT of time. I like the crosswords and test questions for each lesson. The PowerPoints and the readings are not overwhelming for students who struggle with reading and taking notes. [I like]the PowerPoints and fair representation of issues. PowerPoints are excellent for classroom teaching. Crossword puzzles are a great way to work with terms and definitions. Lesson plans are very orderly. I use them in sending in lesson plans to my administrator. I like the PowerPoints, references, puzzles, and questions. I use a lot of PowerPoints as teaching guides and having them available saves time. I like the PowerPoints and would love to have more of them. I love the interactive crossword puzzles, power points etc.... It saves me so much time having the PowerPoints completed already by your company. A goal of mine is to use even more of your website next year (daily quizzes, issues etc). The crossword puzzles are a wonderful tool, and can be made into quizzes.... It has been a lifesaver to have this program available. I was thrown into the ag teaching position with two week's notice this past January. There were no course outlines, no record of what had been covered except ill kept notebooks, and was a daunting proposition, trying to start ...somewhere...and get these kids learning. Though I don't know all the different aspects where this website could have helped, (it was hard enough just getting ready for the 5 different classes each day, taking a college course, and caring for my two kids, so there wasn't time left for exploring), being able to access this and have at least a beginning for my classes, along with the vast information on the web was what kept me going. Thank you. The power points are a good summary of the lesson. I actually copy the lesson (hope that is ok) and then I have the students underline and hi-lite the information before doing the worksheets. This has been a great help to those that do not read well or comprehend well. They follow along as we do the power points and then the worksheet and crossword allows us to test their comprehension. For those that have the serious reading problems it has seemed to be a very big help. We discuss the PowerPoints and expand on them as we go along. All students have the password and Id to use at home, however, the classwork that we do in small groups seems to help the most. I like the crossword puzzles, worksheets, etc and the internet sites that I can go to while teaching and show the students more up-to-date information. The PowerPoints are also helpful in the teaching process. Your information is very useful for substitute teachers and it easy for them to use and follow. I think it is a great resource! I use it often for reference material. The PowerPoints and crosswords are great, especially in a pinch! I appreciate the thoroughness of the subjects covered. [I like the] lesson plans, especially with crossword puzzles and PowerPoints that can be used for class. News often can directly relate to information being taught in the classroom. I like that it is somewhat difficult for my students to find the answers to the test questions and the crossword puzzles. They actually have to read and think about many of the questions in order to answer them. These assignments provide a challenge for my students. I enjoy the exercise applications along with crossword puzzles. It is great for substitutes. What I like best is the extra support it gives me on any topic. Especially the PowerPoint features to the lessons. It is quick, self-explanatory and the PPTs are short. I like the PowerPoints when they are available. I really like using assessments off of the site. The PowerPoints are good. I love the PowerPoints and crossword puzzles. The PowerPoints and the lesson info are up to date. [I like] Ag Ed Today News! We use this as daily bellwork. Really great for keeping students up to date on what's happening in the ag industry. Weekly quiz offers accountability. I like the daily news and weekly quiz. I love having the current events. I feel the AgEd Today news is one the most important things I do in my classes. I copy the daily AgEd Todays and students read these for "bell work" while I take care of attendance, backwork, handbacks, etc. Then we briefly discuss each story before moving into the day's lesson. I have block classes which allow me to do this. Most weeks we use the Friday PowerPoint review (I Read That) and the quiz.... I like the mix of stories. I like AgEd Today best. It is a way to bring current agriculture to my students and helps them to see agricultures impact on their lives. The lessons are good, especially with the student activities and tests at the end of each lesson. I utilize the AgEd Today on a daily basis in my senior Ag Business Management class. I give a weekly test, as well as a nine-week and semester test on portions of the information. I like the fact that it includes current news on local, regional, national, and international topics. I also like the lesson plans that supplement about every area taught in an agriculture education program. They make excellent lessons to enhance the subject area being taught. They also stand alone for those short "mini-lessons" taught when time is not sufficient to begin a new subject area or for substitute teacher lesson plans when I am absent. It is up-to-date material and easily accessed. I really like the daily news. AgEd Today is the best. I like that everything is in one place. I also like having the students be able to do self guided lessons and activities if I am not here! Very easy to use. Don't have to be a computer geek to use your software. Lessons are tailor made for Ag with tests, quizzes, PowerPoints or crosswords. It can be accessed from home or school. Works well for when I am out of the building as the substitute can just take them to computers and they work on their own. I especially like the crosswords as the substitute can record the time it took them to complete. This tells me if they did an adequate job of reading. I enjoy how many different teaching areas there are. Right now I would leave the site as it is. It's nice to have it all in one place. The ease of use and availability is first rate. I utilize the lesson for days when I have to be away from school. I like the easy access and the availability for the students to use at any time. Easy to use, simple instructions. I like the broad base of information that I can access at any time. I also like the short lessons that I can utilize in a variety of classes. Easy to find material. At a good student level, especially when used by a substitute. I like that the students can access from anywhere like when they are on trips or from home. I really like the easy to use lessons. They are easy for substitutes to use or students to follow independently. PowerPoint presentations are high quality and do an outstanding job of summarizing the lessons in an accurate, as well as understandable manner. [I like] ease of use and straightforward lessons. Easy to use. Readily available. I like the organization of the site and the fact that it's easy to find information that is relevant to my courses easily. Also, I love that they have resource links so that students working on research can easily find more information. Easy access, easy use, ties in beautifully with what I am teaching.... Especially helpful when last minute things come up and you need to scramble for something that any teacher can use. I love how AgEdNet.com can be used by students. [I like] its user friendly format and the material used. The information is organized for maximum student understanding. I also like how crosswords can be done by students right online. I like having the information at one site and [it] is easy to access. [I like] the ease of using it. I can leave instructions for the sub and know the work will be done. The lesson are easy to read and understand. They are written at the high school level. I like the ease of movement through the site. Once you have used it a little it is easy to understand the flow. I like the ease with which lessons can be found and used quickly in the classroom. Doesn't need much improvement. I like it as it is. Easy to assign extra credit assignments or independent study to students. It is easy to access and has a lot of information for the teachers and to use with the students. The ease of the program for all users is well done and a student that is absent may be assigned a task. It is easily accessible for my students. Great for sub plans! I like the fact that everything is there, I can print the material and start teaching. I don't have to make tests and answer keys -- it's all done for me. AgEdNet.com is a very easy system to use, not only for me as an instructor, but also for my substitutes and my students. [What I like:] convenience and ease. It is convenient and covers quite a variety of topics. I can use it easily in class with printouts, individual students on computers, or with a large projector in the classroom. Makes a good resource for students looking for reports and papers on ag related topics. I also like the reference to standards. I like the easy use of it. Ease of use is what I like about AgEdNet.com. [I like] the easy way that the information is presented. Also, the student sections that they can access, it makes it much easier when we go to the computer lab. AgEdNet.com is very convenient when getting ideas for lessons. Easy to get around in the different areas. I like the way the lessons are sequential. I have a tip to share too! We always like to hear unique ways you are using AgEdNet.com. Please see our CONTACT PAGE to learn all the ways to reach us.